You have asked for Metal Finishes - now we supply them! Steel Finishes, Metal Coatings, Patinas and Acrylic Sealers are all in stock. These are currently only available in store however we will be offering them online soon! Finishes by Metal Finishes Plus are available in 8 oz bottles, quart containers and by the gallon. These Steel Finishes work on steel and most steel alloys. All of these solutions work at room temperature requiring no additional equipment or special training. These Patina Oxidizers come in four solutions. They are salt-water based and are designed to use on the Copper Alloy Metallic Coatings. 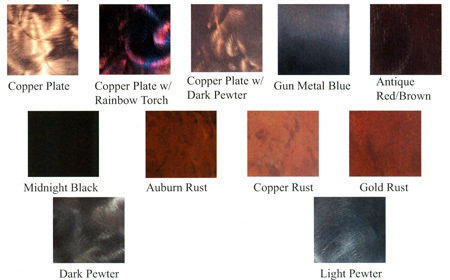 They will oxidize or patina copper and copper alloys as well as the metal in the Metallic Coatings. The colors produced depend on which materials it is applied to as well as which Patina is being used. The Metallic Coatings contain a latex glaze base, then various combinations of real copper alloy flakes are incorporated. The coatings are designed for use on non-metal objects to produce a metallic surface - plastic, plaster, styrofoam and even cardboard can look like metal with these Metal Coatings.